Zipper front rash guard with 3/4 length sleeves. Experiment with over 20 optic activities and learn the scientific explanations behind them. 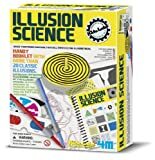 Kit includes illusion tricks card, spinning top with four illusion cards, 3D picture cards, stencil, markers, 3D glasses, carry pouch and detailed information on each optic activity. Zoetropical Fun Return with us now to the world of the very first moving pictures. 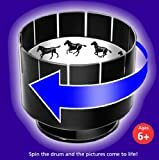 This little foil and paper zoetrope toy measures 4″ dia x 3-1/4″ tall and includes (18) pre-printed strips and (6) blanks to draw your own. Spin the spindle and watch the people dance in this grandfather of the movies.